The Drum Handling Forklift Attachment is a type of drum handler that is designed to easily slide into a forklift truck. This type of drum handler is used to efficiently and safely load and unload different sizes and types of drums. 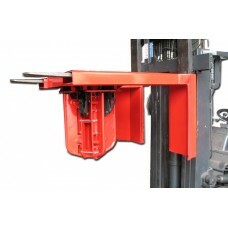 Once inserted into forklift trucks, operators can easily clamp, lift and transport drums anywhere. Yellowbox, the Online Industrial Superstore carries a huge range of forklift attachments besides, Forklift Cameras and Drum Handler Attachments. If there is a forklift attachment in particular that you need, feel free to contact Yellowbox, the Online Industrial Superstore for more details!